Brother Todd is a one-man band at the moment, thus the clever title of his latest CD -- "Oneman." This is not intentional but a simple act of "doing the best I can with what I got." All the tracks were composed and recorded in the basement starting January, 2008, where work continues daily. The videos were also recorded there using the built-in camera and software, thus the striking similarity of the videos. Brother Todd is the man you see in the videos and the voice you hear in the songs. He composes on the guitar and piano. On the tracks, he performs as a basic rock quartet, using; Drum kit -- Yamaha DD55C, Acoustic steel string guitar -- Gould; Electric rhythm guitar -- Epiphon Les Paul; Electric lead guitar -- Fender Squire; Synth -- Roland JunoD; Microphone -- Rode condenser; Guitar Amps -- None; used POD 6. Says Brother Todd, "I realize almost 60 is not the prime time to start a musical career, but after almost forty years of business and family building, and destroying, I picked up a guitar and started writing songs. The 911 attacks opened the door for me but it was loosing every body and thing I had that pushed me threw. I sobered up almost four years ago and started writing about that experience -- about what I was learning. One of the things I learned was how to quiet my mind. That created a space and in that space something always showed up. One of the things that showed up was a direct order to start writing songs. which I did. Since I had never written legitimate songs, most of it was crap, but I held to the notion that whatever I needed would show up. It took a while but what showed up so far has been, from my perspective, miraculous. One of those things was me -- a musical me, transported from where I left music off in the sixties (which explains a lot of the sounds and arrangements). Another was a guy named Guy who shamed me into using my natural voice. I had been trying to sing above middle C which for me is a real stretch and sounded so (you can hear that on my "Under His Table" CD. I'm not recommending that, but facts is facts). So, this January ('08) I started to sing two octaves below middle C. It was terrifying. It didn't sound like any body. Well, that's not exactly true, it sounded like my Dad (and, some say they hear Johnny Cash, Lou Reed or Leonard Coen. I don't, though. Ken Nordine is closer, I think.). After a few experiments with others' material (I did "Hurdy Gurdy Man" and "Jumpin' Jack Flash" which actually turned out really cool) I started writing songs with that deep sound in mind. By May I had what is here and more is coming (I added "Another Way" and "Walk The Talk" last week and am currently working on a new song about "the voice in my head"). I play all the instruments (except on "You Lift Me Up" and "Gunslinger" where the same Guy Hedrick plays some lead guitar). I do the singing and engineered the sessions which were recorded in the basement. The videos were shot in the same room using the built-in camera on the Mac and edited on same with the software that came with the machine. If you can look past the wrinkly old fart, you might catch a glimpse of a skinny teenager finding his way here. I hope so. Surely, without Laura and a lot of help from God Almighty, none of this would exist." RadioIndy is pleased to announced that we have published our CD Review of Brother Todd music to CD Baby. FANS - Please checkout Brother Todd online! FANS - Please checkout Brother Todd iTunes page play / purchase some great new music! RadioIndy is pleased to announced that we have published our CD Review of Brother Todd music to Facebook. FANS - Please checkout Brother Todd page and sample / purchase some great new music! RadioIndy created a CD Announcement Press Release for Brother Todd on Digg.com! 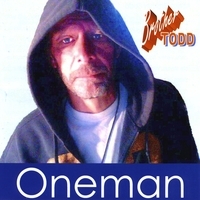 RadioIndy is pleased to present Brother Todd with a GrIndie Award for the CD "Oneman"